program developed by CERES and the Gould League called 'Sustainable Schools' over 10 years ago. ResourceSmart AuSSI Vic is currently an initiative of the Victorian Government and is managed by Sustainability Victoria, integrating state and federal programs and bringing together sustainability educators, facilitators and organisations. and their communities to learn to live and work more sustainably. Pender's Grove were delighted to be awarded with their 2nd Sustainable Schools star in early 2017 and are currently working on the school's waste management as the focus for our "3 star" accreditation. 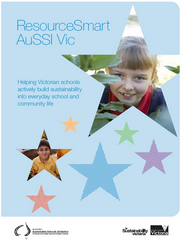 For more information, please download the ResourceSmart AuSSI Vic brochure. Please speak with Saskia to find out more.